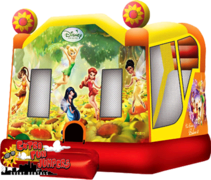 Extra Large Tinkerbell Fairies Combo with a large bouncing area, basketball hoop, climber and a 9ft slide at a 65 degree angle. This unit can be used Wet or Dry. Rentals are for children under 12, not designed for teenagers and/or adults.